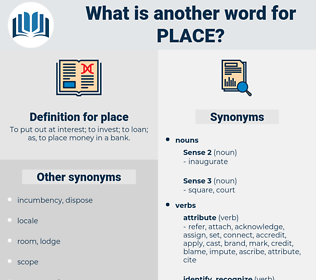 What is another word for place? opens, Habitats, forges, Was, Forms, Does, meetings. pleasures, landscapes, Locales, destinations, Resources, practitioners, Consultations, results, jurisdictions, alternatives, regions, levels, vaccinations, Capacities, contributions, Activities, massacres, reports, intervals, Roles, Regulations, structures, locals, hallways, Facilities, annotations, battles, Opportunities, arrangements, inputs, squares, rankings, licensees, incumbents, strengths, reasons, stages, outlets, Suggestions, Records, cases, elections, protagonists, contacts, Efforts, Trustees, homes, Interviews, discussions, Duties, Enemies, Standards, visitors, Policies, pins, questions, reviews, Bays, Addresses, stores, Feet, books, MINERS, schemes, needs, events, Forums, Programs, doors, BOMBS, visits, dates, controls, systems, Boots, Ones, meetings. 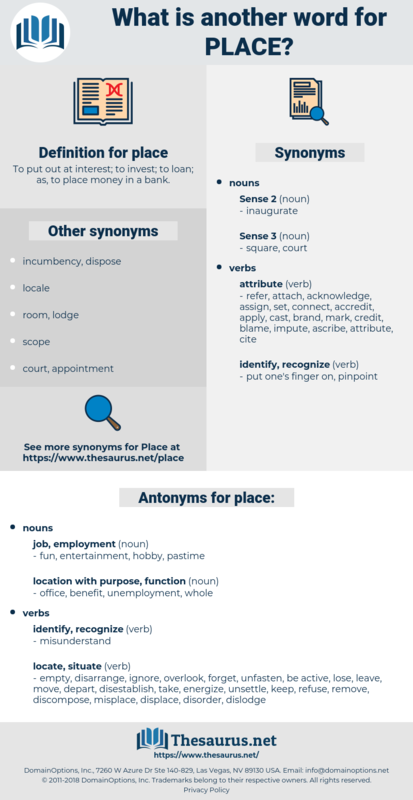 Afghans, data, apartment, resting-place, stead, existence, instance, platz, corner, destination, locale, presence, prominence, course, occurrence, LOC, foothold, marketplace, substitution, headquarters, creation, job. replaced, Existed, Introduced, involved, led, Happened, produced, Proceeded, opened, Caused, Occurred, Achieved, suggested, Followed, Resulted, proposed, effected, Belonged, Carried, attached, Launched, decided, Performed, staged, considered, paid, noted, Waged, Began, said, Pushed, posted, addressed, retained, needed, built, Awarded, dropped, Knew, Served, Met, positioned. Enacting, executing, resulting, laying, Originating, Stationing, coming, using, Constructing, pushing, investing, loading, pinning, going, raising. replaced, Existed, Accommodated, Introduced, assembled, spotted, Superseded, arranged, rescheduled, Convened, located, Occurred, laid, effected, conceived, Carried, designated, Performed, Instituted, Devised, Waived, warranted, invested, seated, Yielded, supposed, forged, posted, built, timed, positioned. replaces, includes, involves, leads, happens, classifies, establishes, proceeds, presents, confronts, highlights, arises, operates, identifies, sets, feels, belongs, Comes, lies, attaches, situates, considers, Leaves, treats, transfers, suffers, views, poses, stresses, invests, results, falls, requires, maintains, keeps, ranks, begins, brings, fits, likes, stands, Gives, takes, shifts, raises, Rests, puts, serves, hovers, runs, wants, gets, needs, Forms. finished, impose, imposing, situate, incorporate, allocating, developing. empty, disarrange, ignore, overlook, forget, unfasten, be active, lose, leave, move, depart, disestablish, take, energize, unsettle, keep, refuse, remove, discompose, misplace, displace, disorder, dislodge. refrain, scatter, neglect, conceal, retract.
" Yes," he said, " I was told of the place." You'll understand more when you see the place. sanctuary, target, grave, summit, place of birth, holy, high, centre, crown, nesting place, rendezvous, heights, peak, puddle, pool, birthplace, polling place, showplace, hiding place, sanctum, solitude, polling station, colony, tomb, service area, overlook, boatyard, zone, holy place, hole-in-the-wall, crest, top, stop, scour, hatchery, junction, target area, end, tip, mecca, center. vicinity, point, geographic area, locality, neighborhood, neighbourhood, geographical region, neck of the woods, geographical area, geographic region.